It’s too soon to tell whether it’s a boy or girl, but the Toronto Zoo’s newest addition is 100 per cent adorable. The zoo announced Tuesday an endangered African penguin chick hatched on March 1. And while he — or she — continues to grow, the public won’t be able to see the chick. 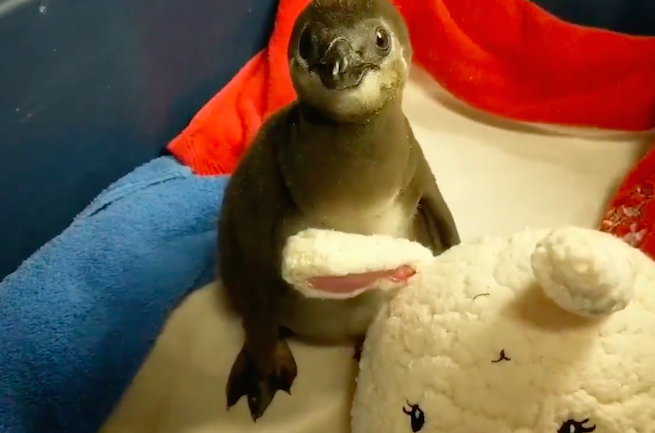 “African penguins do not show sexual dimorphism, so until bloodwork is performed by our Wildlife Health Team, we won’t know the gender,” the zoo explained. The chick’s family tree is a bit complicated. The egg was laid by penguin pair, Ellie and Chupa, and is the third chick for them. But the parents are “fairly inexperienced,” the zoo said, adding they have only raised one chick themselves. Incubation usually takes just over a month, and then chicks stay with their parents in the nest for another three weeks. The babies become independent quickly. Around day 21, zookeepers typically begin the hand-rearing process. Right now, keepers are teaching the chick to be fed fish and to get on a scale for daily weight checks. The unnamed chick is also all kinds of cute. It is also very rare. Of the 18 penguin species, the African penguin is considered among the most endangered. In a century, the wild population has been cut by more than 97 per cent as climate change and over-fishing has hurt its food supply. Disease, predators and oil spills have also hurt the species. “Recent estimates suggest, there could be as few as than 25,000 breeding pairs left in the wild,” the zoo said.